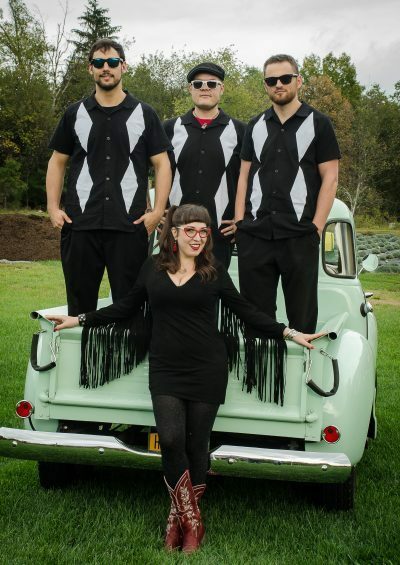 Winner of the 2017 Ameripolitan Music Award for Best Female Rockabilly Artist, and named the “Best Up-And-Coming Band” by Hudson Valley Magazine, Lara Hope and the Ark-Tones are New York’s premier Roots rock n’ roll & Rockabilly Twang outfit. The Ark-Tones recently released their 2nd full length album, Love You to Life, and they have been hitting the road hard, spreading the gospel of American music wherever they go. Describing their sound, Hope explained, “I would say we are a new take on an old sound. It’s been described as ‘pan-americana’ which means we use many areas of early rock and roots music as a creative launchpad. Where it goes from there is anyone’s guess, because while we appreciate old music, we don’t want to write songs that have already been written. They’ve built a great network of venues in the US by touring heavily, and like many American bands, they have gained supportive fans and excellent press overseas as well. They just completed their first European tour, spending the month of April 2018 in Belgium and Holland. Hope was featured on the cover of UK Rock n’ Roll magazine in March 2015, and New York’s Ulster Magazine in March 2016. The band has shared the stage with many larger acts including Joan Jett, Tiger Army, Gary US Bonds, Dale Watson, America, and others, and has performed at at a variety of national festivals including Viva Las Vegas, Ink n Iron, and The Nashville Boogie. They will be on tour for the summer of 2018 supporting The Reverend Horton Heat and The Blasters!